How easy is it to build lean muscle? Well, I guess I’ve been finding out lately! For the past three months I’ve follow the Forever FIT 2 programme – which essentially means lots of Aloe Vera plus some nutritional support and the Forever Lite protein and nutrition shake which is design to more easily be metabolised and so aid in the building of lean muscle. Oh, and of course, fairly high calorie exercise 5 days per week (2 days off per week) ranging from 5km to 10km runs plus some daily press ups, dry swimming and planking. 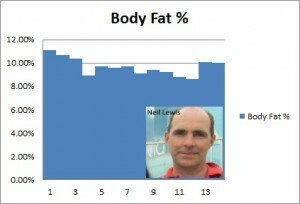 So what are my FIT 2 results? 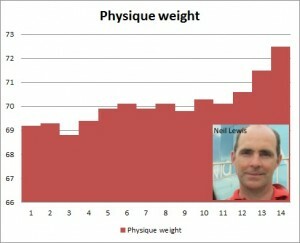 Pretty good I think – adding about 3.5kg of lean muscle to my physique. I guess I could have gone further / faster with a higher intensity of exercise, but I wanted to do this and remain injury free – which so far I have, and also whilst increasing my calories to compensate for the extra exercise, I wanted to maintain my body fat at a low – but sensible – level. Still, my primary objective was for this to be fun and injury free so I didn’t feel the need to push myself all the time. The key here is that whilst the fat levels rose over Christmas (slightly) they’ve been more or less maintained whilst I’ve been feeding my body the extra protein I needed to build muscle. Well, my goal is to run a 10k in 48 minutes – which is a 3 and a half minute improvement on my personal best – which was set on a flat and windless course! My first attempt will be in Cheshire at Oulton – which is a motor race course – so smooth but with ups and downs! In the past couple of weeks I’ve been able to increase my weekly running distance from about 18km per week upto 35km per week without too much muscle fatigue. So, we shall see what happens in the race on Sunday, but for sure, I’m going faster and more easily than ever before.